Actor Tom Mix was already a major box-office draw when, on May 11, 1920, Judge John F. Powell issued a warrant for him to appear on a criminal charge of driving recklessly through the streets of Newhall. The court record doesn't give us the sordid details ... Was he drunk? Did he put citizens' lives in peril by exceeding the posted 15mph speed limit, or kick up dust in the still-unpaved streets? We just don't know. But we do know the violation occurred April 28, 1920 — a clear and sunny day with a high of 86 recorded at Mission Hills — and we know that for whatever reason, Deputy Constable W. King Collins waited two weeks before he appeared in Powell's courtroom to swear out the complaint. Powell's "courtroom," of course, was an office in his house on Railroad Avenue between Market and 8th streets. Newhall didn't have an actual courthouse building then. It's said his office could fit three people. Mix pleaded guilty. Powell fined him $50 — quite a sum at the time. Mix paid it on the spot. The alternative would have been a day in the local hoosegow (still standing on Spruce Street next to today's Old Town Newhall Library) for each unpaid dollar of the fine. Perhaps it was prophetic. Twenty years later, a 60-year-old Mix would be killed in a car wreck in Arizona after visiting a popular bar and casino. Driving a spiffy 1937 Cord on the open highway, he didn't notice that a bridge had washed away in a flash flood. When he jammed on the brakes, a metal suitcase full of money behind him flew forward and smashed his skull. Back to 1920. Powell was justice of the peace of the Soledad Judicial District, which was how the court system was divided up — into judicial districts. The Soledad district spanned the entire 1,200 square miles of the north county from L.A. city limits south of Newhall to the Kern County line. That's why Powell sometimes held court in other locations and even outdoors, when a case drew a crowd. As for Collins, the community was still policed by constables (old-time lawmen), but they were part of the Sheriff's Department after 1913 when L.A. County adopted a charter. Previously, constables had been locally elected. The constabulary was eliminated in July 1936. Curiously, Mix's driver's license number was 6666, as shown below. THAT Tom Mix of Los Angeles, on the 28 day of April 1920, at Newhall in the County of Los Angeles, State of California, committed the crime of operating an automobile upon the public highway in a reckless manner, in violation of Sec. 22, Motor Vehicle Act. Complaint filed. 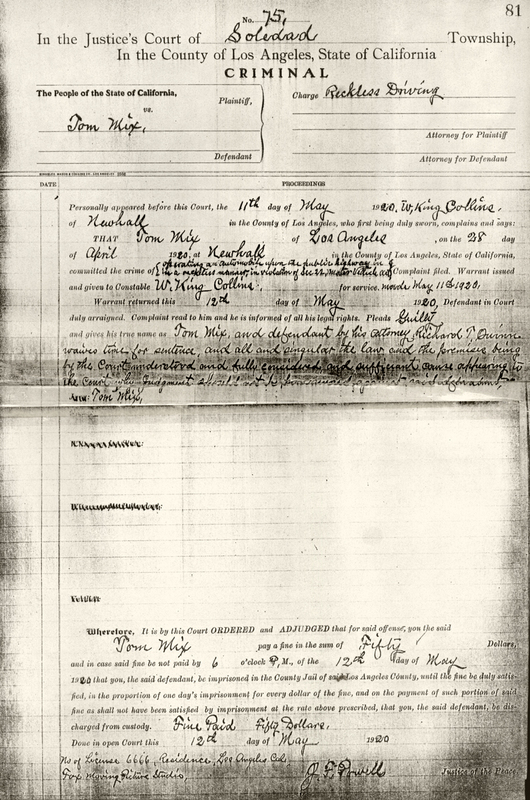 Warrant issued and given to Constable W. King Collins, for service, made May 11th 1920. Wherefore, it is by this Court ORDERED and ADJUDGED that for said offense, you the said Tom Mix pay a fine in the sum of Fifty Dollars, and in case said fine be not paid by 6 o'clock P.M., of the 12th day of May 1920 that you, the said defendant, be imprisoned in the County Jail of said Los Angeles County, until the fine be duly satisfied, in the proportion of one day's imprisonment for every dollar of the fine, and on the payment of such portion of said fine as shall not have been satisfied by imprisonment at the rate above prescribed, that you, the said defendant, be discharged from custody. Fine Paid Fifty Dollars. No of License 6666, Residence, Los Angeles Cal. J.F. Powell Justice of the Peace. AA2001: 19200 dpi jpeg from photocopy, collection of Judge Adrian Adams.